Since we first opened our doors for business, Jungle Jumps has been dedicated to manufacturing the very finest commercial-grade inflatables on the market. Our California manufacturing facility produces hundreds of different sizes and styles of inflatable, from traditional bounce houses to water slides, wet-or-dry slides, interactive games, and obstacle courses. We believe that our customers deserve the very best, and that includes our commitment to rental business owners. We provide incredible wholesale prices on our exclusive package deals and back each inflatable purchase with the details you need to run a successful inflatables rental operation. New rental business owners know that building company inventory is the key to long-term success. Starting small is always a great idea, but many business owners want to dive right in to the world of commercial-grade inflatables. Bounce house and inflatable slide inventory represents significant startup costs, so doesn’t it make sense to find the best deals around? As a courtesy to our customers, Jungle Jumps offers special wholesale pricing and deals throughout the year, helping new business owners save money as they get started. Our package deals are a great way to get started, allowing you to build your inventory quickly and efficiently. 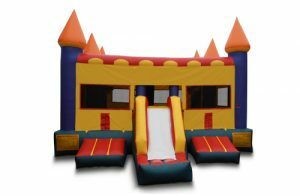 We offer several packages, ranging from two castle-styled bouncers with accessories to our giant Biz Startup Pack, featuring six different inflatable products and everything else you’ll need to kick off your rental business. These package deals are also ideal for established operations, saving money while giving you great new products for your rental inventory. As with all of our quality products, we use only the finest materials and construction methods to ensure lasting performance. Our designers and assembly teams are tasked with creating colorful, durable, and fun inflatable products, and we deliver time and again! Finally, each of our products is backed by one of the best warranties in the inflatables business. Jungle Jumps is known for our top-quality inflatable products, all manufactured right here in the U.S.A. We don’t stop there, however – we know that new business owners will have many questions as they embark on their journeys to financial success. Jungle Jumps is ready to help answer those questions. To help our commercial customers, we provide an incredible wealth of information. Our eBook entitled “Guide to Starting and Operating an Inflatable Rental Business” is unique in the industry, and it is packed with every detail you’ll need to set up your company and operate it efficiently. Our eBook covers everything, from the different inflatable products on the market to the additional equipment you’ll need, choosing a business name, creating a business entity, and even handling insurance and taxes. With this rich information at your fingertips, your success is all but guaranteed. Our customer service department is equipped to provide our customers with industry-leading support. To get a quote on a new product, troubleshoot a problem, or to get advice on running your own inflatables rental business, just give us a call or use our convenient online contact form. Our customer service team has been recognized for excellence – it is a testament to our commitment in providing world-class products and services to our customers around the globe.